Product categories of Pumpkin Seed Kernel, we are specialized manufacturers from China, Pumpkin Seed Kernel, Pumpkin Kernels suppliers/factory, wholesale high-quality products of Pumpkin Oil R & D and manufacturing, we have the perfect after-sales service and technical support. Look forward to your cooperation! Pumpkin Seed kernels grow in Northwest and Northeast origin of China and have different types of seeds. Shine Skin Pumpkin Seed kernel, Snow White Pumpkin Seed kernel and GWS (Grown without shell) are three main type of pumpkin seed kernel that commonly see in the market. 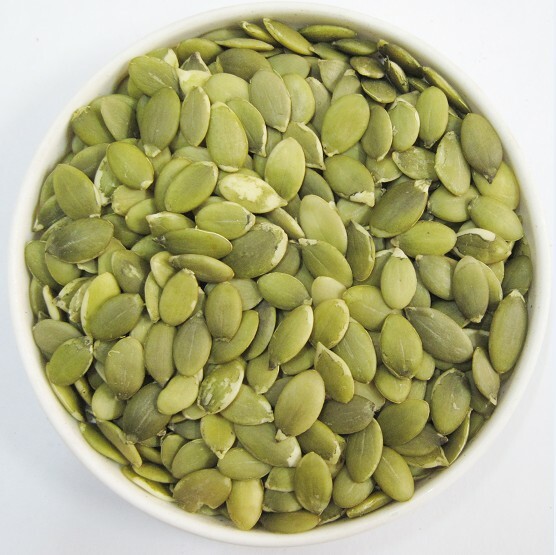 Pumpkin seed kernel is also known as pepita. It is the edible seed of a pumpkin or certain other cultivars of squash. The seeds are typically rather flat and asymmetrically oval, and green in color and may have a white outer hull. Some cultivars are hulless, and are grown only for their seed. Our company has one production line specially process all kind of pumpkin seed kernel.